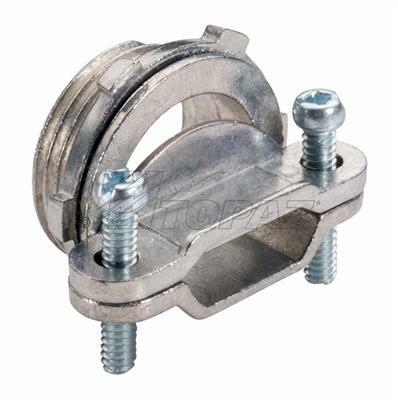 955 Oval NM Cable Clamp Connector 1-1/2"
Topaz’s oval design NM Clamp Connectors are recommended for use in dry locations to bond flexible nonmetallic conduit to boxes or enclosures and can accommodate up to 2 cables at once. Naturally corrosion resistant zinc die cast construction with two screw assembly to assure a secure connection. Long lasting and dependable fabrication; 3/4” to 2” sizes for oval NM cable up to 1/0-3 to 4/0-3. UL listed.